The sugar industry is primarily a rural based industry, and the rural communities that form part of its footprint are a key stakeholder to its sustainability. In order to maximize the development of both the people and the land, the sugar industry has formulated a rural development strategy that proposes an inclusive rural development model for the cane growing areas of communal land. 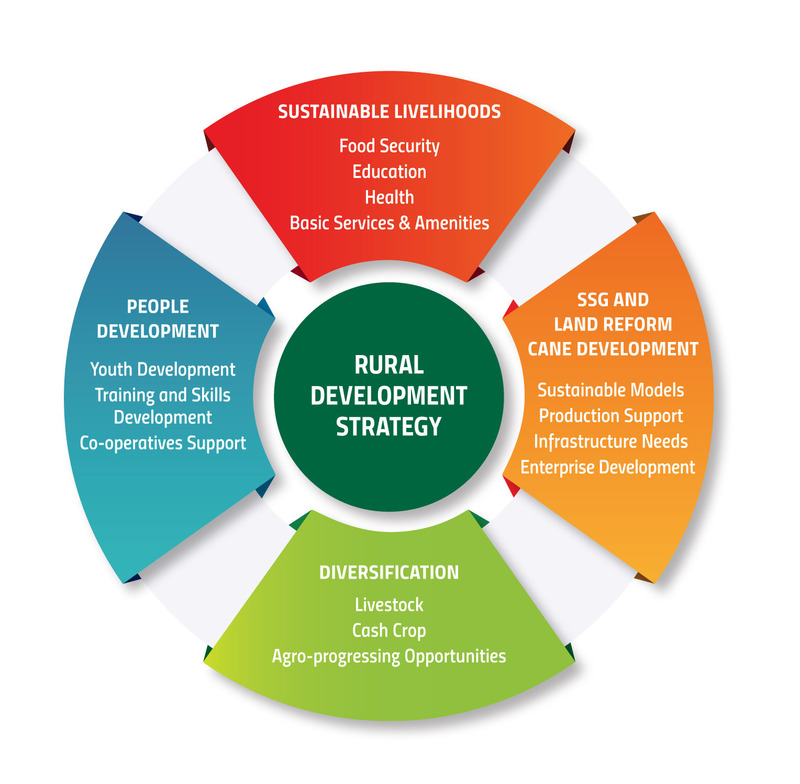 The strategy provides a framework that will facilitate the coordinated implementation of interventions aimed at developing stable and prosperous rural communities. The model proposes an integrated approach to sustainable cane development which is supported by the provision of strategic infrastructure, and support for the development of community based enterprises in the sugar cane production value chain. The model also acknowledges that other commodities like livestock and cash crops need to co-exist with sugar cane. It is envisaged that partnerships will be developed between government, communities and the industry in the implementation of projects. The sugar industry takes seriously its broader obligations as a responsible citizen within the sugarcane growing communities. It has been actively involved in education and training; and sustainable development activities for many years with substantial financial support provided to a variety of community based organisations and academic institutions. Prospective applicants are urged to review the guidelines to ensure that their projects and/or initiatives fall within the sugar industry and SASA’s specific areas of focus – sugar donations and enterprise development programmes. *PLEASE NOTE: Funding is not guaranteed. Applications for grants are invited from organisations within the sugarcane growing provinces of KwaZulu-Natal and Mpumalanga. The organisations should have a broad community reach and profile; should demonstrate sound management and excellence in sustainable development activities; and meet the funding criteria. Organisations should also demonstrate other fundraising activities and strategies. The sugar industry, through SASA, supports and contributes to initiatives, including sugar donations and enterprise development. The sugar industry acknowledges that there are people who find themselves in a persistently poor circumstance, without sustainable support systems at family level to overcome problems such as homelessness, household food insecurity, mental illness, substance abuse, physical disability, emotional instability and unemployment. This population relies on government and community for care and support. The sugar industry, through SASA, has a Sugar Donations Programme (SDP) where organisations within the sugarcane growing communities are given sugar on a monthly basis. More than 100 community based organisations, non-governmental organisations, crèches and faith-based organisations have benefiting from this programme. These are organisations providing meals to children, people with disabilities, the elderly and other vulnerable groups within their communities on a daily basis. The programme also provides once-off sugar donations to organisations involved in special events on an annual basis. Organisations need to outline how the sugar donation will make a meaningful contribution to their overall programme/s. All organisations applying in this programme are expected to complete a Sugar Donations Application form. Each organisation is expected to organise its own transport to collect sugar at the designated milling company on a monthly basis. The sugar industry values the role of entrepreneurship in economic development and job creation. SASA contributes to the development business enterprises. Improvements to productivity or value-add, product development, and infrastructure may be considered. With the limited funding available for this category, a key element of the enterprise development programme is to partner with other organisations on specific projects, in areas which the industry operates. SASA shall consider proposals from existing duly registered enterprises within any economic sector (tourism, manufacturing, services, agriculture), and which contributes towards local economic development within the rural communities in which the industry operates. Multiple-year funding may be considered for projects that have a footprint across the sugarcane growing area. For renewal applications, the proposal should discuss the progress to date on the previously funded project, and what is proposed for the renewal of support. List of current directors and officers. *PLEASE NOTE – More information may be requested from shortlisted proposals. Due to its limited resources, the South African Sugar Association is not able to support all worthy organisations and projects that submit funding requests.